Bhikkhuni Tathaaloka was born in Washington, DC in the 1960's to environmentally-minded scientist parents. In the midst of images of war and protest, fears of nuclear holocaust and environmental degradation, she grew up in a climate of tremendous social and academic openness and inquiry in the search for more enlightened ways of human life. With family members and friends of various religious and philosophical backgrounds: Christian, Atheist, Material Scientist, Muslim, Jewish, Taoist, Native American; early in her life she began to wonder and question deeply what might be true and of real value in life. She followed her mother's example by observing nature for answers and for peace, and her father's example of inquiry through scientific research and investigation. Through stories of seekers and sages both historical and mythical, she was inspired to walk their path, if a way could be found to do so. In her early teenage years she heard rumors of Westerners who had been ordained in Southeast Asia , and of their experiences amidst the Buddhist monastic traditions there. A glad determination sprang forth in her heart when she heard that in Buddhism, both in ancient and modern times, there were both male and female monks; samanas whose lives were dedicated to inquiry and had realized awakening. At age 20, urgently inspired by the sudden death of a close friend, she left university, and entered monastic life as an Anagarika. She left her home country full of hope in search of monastic training in the ancient traditions. In India , she found the state of the monastic communities to be quite different than described in the ancient texts, but inspiring nonetheless. From India , she chose to travel to North Asia , after hearing of the still-living monastic traditions where there were full opportunities and support for ordination, education and training for women in monastic life. She found her Bhikkhuni teacher, Bhikkhuni Myeong Seong (Sunim), and a strong and thriving women's monastic mountain-forest-meditation tradition in South Korea. 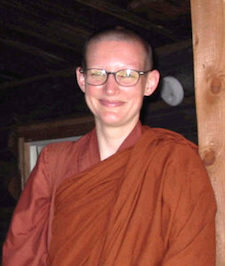 Returning to the United States , in early 1997, seven years after beginning her journey into monastic life, Ayya Tathaaloka went for Bhikkhuni Upasampada with an international gathering of the Bhikkhu and Bhikkhuni Sanghas from Sri Lanka , Thailand , Laos , Cambodia , Vietnam and Korea in Los Angeles with the late Bhikkhu Ratanasara Sangha Nayaka Thera as Upajaya. Since then Bhikkhuni Tathaaloka has focused on studying and practicing the Dhamma and Vinaya and especially on developing the skillful training of the mind in meditation. Gladly connecting with the Thai Sangha in America and the Western Sangha of the Thai Forest tradition of Bhikkhu Ajahn Chah and Bhikkhu Ajahn Mun, she has traveled twice to Thailand to visit the meditation monasteries and to walk tudong through the northeast. At the behest of her teachers, and out of gratitude for all the benefits she has received from the Sangha, she also taught in the Bhikkhuni Sangha University in South Korea in “English Dhamma Communication” and has conducted research in World Bhikkhuni Sangha History. As part of this work, she visited the Sangha Universities and Mahapajapati Theri Nuns' College in Thailand to develop connections between northern and southern Buddhist traditions and provide greater opportunities for Buddhist meditation practice and education. This past year, recognizing the growing number of Bhikkhunis and Samaneris in the United States and the true value of coming together in harmony in Sangha, Bhikkhuni Tathaaloka proposed and participated in the founding of the North American Bhikkhuni Association. Several months later, with the encouragement of Buddhist teachers and friends, she founded the Dhammadharini Vihara and Support Foundation, dedicated to providing opportunities through both moral and material support for the many women in her area interested in monastic life, Dhamma study and meditation retreat. She currently lives as the Abbess of Dhammadharini Vihara in the San Francisco East Bay area of Northern California, with a thriving, newly-developing Buddhist women's monastic community.